No one had imagined before elections that Donald Trump as their leader sitting in the Oval Office. But long ago, Simpsons had predicted that this business tycoon will become leader of the free world. Donald Trump was mocked all along his presidential campaign because America was considered insane for selecting him as their President. But everything went as bad as possibly it could and Trump got selected as president for 2016 Presidential election. Nobody pictured him as a leader but “Bart to the Future” episode of “The Simpsons” however predicted Trump as the next president. In this episode, Bart Simpson in his 30s is shown unhappy with his life as an unsuccessful musician who is not at all appreciated by the audience. Future for Simpson seems gloomy and depressing where as his sister Lisa is enjoying every moment of her life. For her the future is far brighter than his brother’s as she has been selected as the chief executive of the United States. She is America’s first ever straight female president who is occupying the Oval office which has been recently emptied by President Trump. This episode shows the miserable situation of the country after Trump’s presidency ad also leaving behind big budget crises for Lisa to deal with. Her advisors inform her about the ultra-strong super-criminals that have emerged as a result of Trump’s initiatives. The country is represented in fact as the neediest that is under debt of every country due to borrowing. 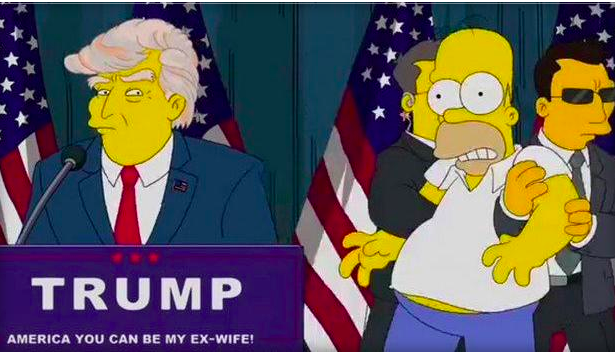 According to the writer Dan Greaney, Simpson’s episode was a warning for American citizens about the situation id Trump is elected as President. But now, Donald Trump has been elected as the 45th President of United States and the world must hope that the world under Trump’s control is not as dreadful as it was presented in the Simpson’s episode.